The latest figures released by the Home Office confirm our worst fears - the number of animal experiments carried out in Britain continues to spiral upwards and out of control. About 4.1 million experiments using animals took place in 2012, up from 3.8 million in 2011. This represents a sharp rise of 8% in just one year! The Coalition government is failing miserably to deliver its post-election pledge to “work to reduce the use of animals in scientific research.” It’s essential that government takes decisive action now to prove it’s genuinely committed to reducing the number of animals used in laboratories. 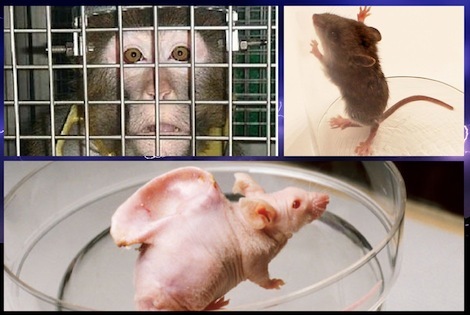 More than 50 years have passed since the launch of the 3Rs principles (refine, reduce, replace), yet a record number of animals are being subjected to pain, fear and certain death in experiment laboratories. Naturewatch is campaigning for the government to take a common sense approach to addressing this serious issue: Impose a levy on each animal used. This easy solution, which won’t cost the government or taxpayers a single penny, will provide substantial additional funds for developing non-animal testing methods. The funds raised by the levy would need to be ringfenced by the treasury to ensure the charge is not classified as a tax. Join our campaign today: ask your MP to express his/her support for the introduction of a fee-per-animal structure signing EDM 199.